﻿"I want to be your favorite window cleaner!" Long has it been said that window cleaning is a delicate blend of science and art! Ziggy has been mastering these skills for the past 15 years and has been providing quality pressure cleaning services for 20 years. For the best in classic customer service, outstanding performance, and competitive pricing, Ziggy provides service and trust unmatched. Value and reliability, honesty and integrity are a few of the virtues we aspire to maintain. ﻿Clean windows bring curb appeal to your residence or business! 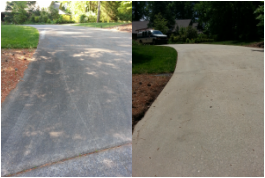 Pressure washing surfaces provides crisp presentation of your property. Whether preparing concrete, stucco, or wood for painting or sealing, or just general clean up, we can help! Desert sunlight takes a toll on vinyl screens. Over time, dry rot sets in and damages the fibers and plastic corners, making for unsightly, and in some cases, unusable screens. Ask about our screen repair services, as well as pet screening, and solar screening solutions!